Frantic Mama: Only Trollops Book Release! An anthology I contributed to, Only Trollops Shave Above the Knee: The Crazy, Brilliant, and Unforgettable Lessons We’ve Learned from Our Mothers, is a compilation of “momisms and other things our mothers taught us throughout the years,” and it is being released TODAY, April 30, in both print and eBook format on Amazon and other retailers. 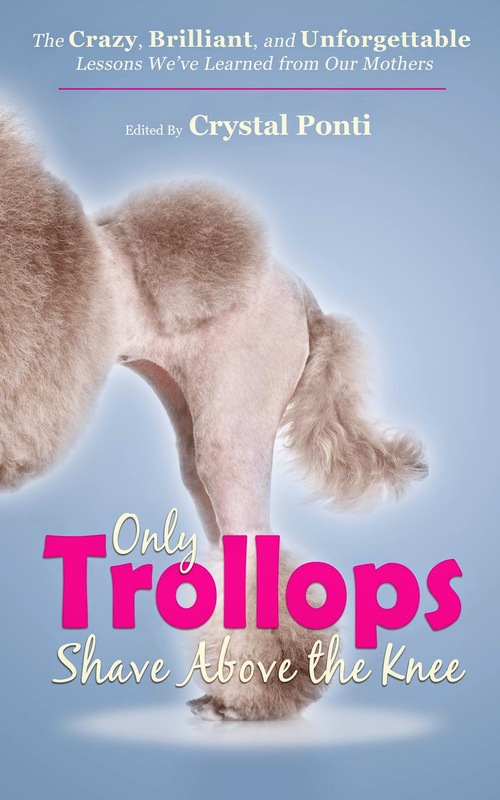 Only Trollops Shave Above the Knee blends more than forty heart-warming, funny, and authentically told stories about the craziness of growing up with the anecdotes that keep mothers sane. Whether it’s a traditional lesson about the value of money or a hilarious outtake about the proper way to shave, any person who cherishes their mother will relate to the stories in the book. “When you were growing up, your mother’s advice might have made your eyes roll in exasperation, squeeze shut in frustration, or tear up with emotion—all in one conversation. Only Trollops Shave Above the Knee brings you back to those days, in a very good way,” says J.D. Bailey, humorist and creator of Honest Mom®. I am personally dedicating my story to my mom...of course! If you order a copy-- for yourself, a friend, or your own mother-- please let me know what you think! I'm really excited about this one and grateful for any reader support. P.S. I'm not yet revealing the title of my essay on the blog. I have to keep you all in suspense :).